A special Secret Santa is set to bring a little sparkle into the lives of domestic abuse survivors this Christmas. A local woman, who wants to remain anonymous, is making a special gesture to women who have experienced abuse by giving them a special luxury treat bag. “The idea came to me after witnessing the kindness of people with huge piles of Santa parcels for children appearing through the city,” she said. The woman, who calls herself “The Bag lady” contacted Foyle Women’s Aid to research the idea. “Domestic Violence victims often have reached rock bottom before they look for help,” she explained. “Confidence and self-esteem are often at a low ebb and can remain so, even after they have got away from the abuse. “Hopefully to receive a luxury bag of treats at Christmas will help make the feel special and acknowledged,” she said. Foyle Women’s Aid, fully back the “Bag Lady’s” plan: “Pulling Christmas together for their families can be a stressful and difficult time for women who have been abused. It is true that they go without themselves to make Christmas magical for their children,” a spokesperson said. 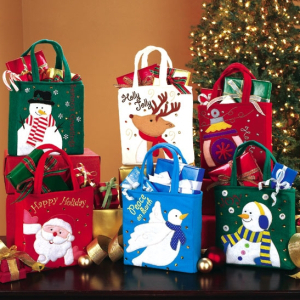 The “Bag Lady” has set a target of 100 bags this year and has started fundraising to purchase the contents. If you want to join the Bag Lady in spreading Christmas magic this year you can help by making a donation by contacting Foyle Women’s Aid on 02871416800 or info@foylewomensaid.org. Or directly into a bank account has been set up Sort Code: 950676 Account Number: 30006513. Mark your donation “Bag Lady appeal”. Or you can donate by texting FWAS90 £(followed by the amount up to a maximum of £10) to 70070. 0 responses on "The Bag Lady Wants To Give Christmas Treats To Women & Children In Our Services"